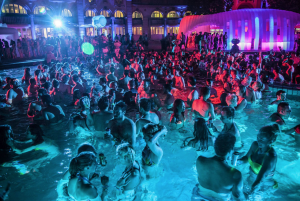 Enjoy the most special nightlife phenomenon in Budapest: partying, clubbing, dancing while soaking in the natural warm spring waters. 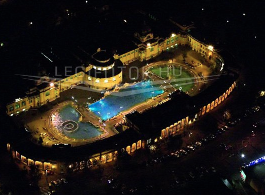 The venue of the spring time Magic Bath parties used to be Lukacs Baths, but from 2018 the all-time venue is Szechenyi Bath. Watch oooout! Splash!!! 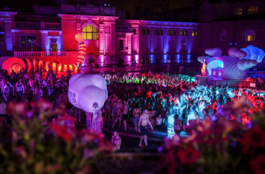 Please check the price list and tickets on Szechenyi Baths Magic Party Prices. What is included in the regular price? Please note that not all of the tickets include drinks or towel rental. The bar is packed with drinks (beers, wines, juices, etc.). Please bring your own towel, flip flops and swim wear (everyone has to put on – and hold onto – a swim wear, speedo, boxer, bikini, what have you). Towels are only included in the Bonus Party Deals. No drinks, foods, drugs can be brought to the premises. 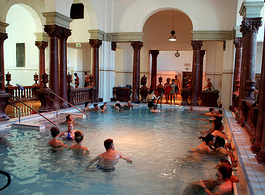 When are bath parties in Lukacs Bath? 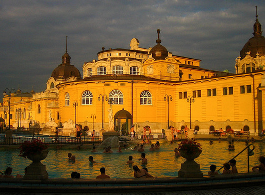 In 2019, all bath parties will be held in Szechenyi Baths, therefore, there will be no parties in Lukacs Bath this year. The party organizers reserve the right to change the venue if needed. There have been parties in Rudas Bath too. Saturday Bath party series in Szechenyi Bath are almost every Saturday throughout the year (except January, which is traditionally a break in the party series): we will keep you posted about the upcoming party spring and summer dates: the biggest summer sparty date always coincides with the Sziget Festival period, please check our party calendar for the exact dates. Drinks: alcoholic and non-alcoholic drinks will be sold at the party (the legal age for drinking alcohol in Hungary is 18 years old). 18 is also the minimum age for getting into the party. Cabins / Lockers: make sure to check that you have closed the door with your special code in the chip equipped silicon wristband. If there should be any issue, please contact the event manager on the spot, or any of the party hostesses. They are happy to help you. 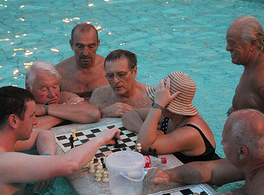 Szecska bath parties, known as sparties at Szechenyi Bath are extremely popular at Szechenyi Bath in the summer time. But you should not be stranded in winter either. 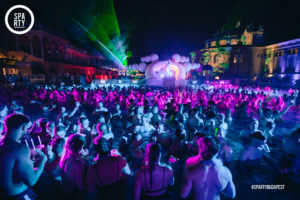 The biggest of all Magic Bath Parties in Budapest is a special edition on December 30, 2019: a Cinetrip Budapest Party in December with loads of awesome shows, the best DJs, etc. It is a pricier one off magic bath party, but it is a mega party indeed.